We’d love your help. 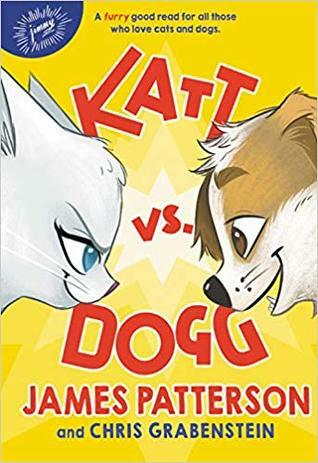 Let us know what’s wrong with this preview of Katt vs. Dogg by James Patterson. Molly is a clever katt who just knows sh For anyone who loves cats, dogs (or both! 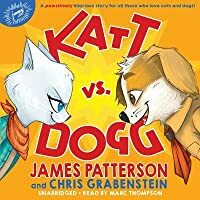 ), James Patterson's most pawsome story ever is set in a society defined by the oldest rivalry in the world: katts versus doggs! To ask other readers questions about Katt vs. Dogg, please sign up. You know, I didn’t expect to actually learn meaningful information about cats and dogs from this fiction book, but that’s my fault for underestimating a middle grade story as well as the great James Patterson himself. For example, I had no idea cats could climb up trees easily but had difficulty climbing down them. In this partially illustrated tale, cats (katts) and dogs (doggs) despise each other. They believe it is in their nature to do so and barely even question why they have such hate towa You know, I didn’t expect to actually learn meaningful information about cats and dogs from this fiction book, but that’s my fault for underestimating a middle grade story as well as the great James Patterson himself. For example, I had no idea cats could climb up trees easily but had difficulty climbing down them. In this partially illustrated tale, cats (katts) and dogs (doggs) despise each other. They believe it is in their nature to do so and barely even question why they have such hate toward one another. It just is. It’s an instinct. It’s what makes this world go round. Until… one katt and one dogg become lost together in the wilderness and must join forces to survive the creatures that roam the night and day and the many other obstacles that keep them from running back to their camps. It is delightful. I dearly appreciated the illustrations and couldn’t get enough of the two main animals: Molly, the katt who dreams of becoming an actress, and Oscar, the cute little dogg who gets distracted very easily. This is the sort of book that you can finish in one sitting without problem. The story flows extremely well—it doesn’t drag nor info dump you—and it feels like the kind of story that should have been told a long time ago. Maybe it has, but the way these authors handle the topic is original, and I for one hope a second book is planned. Oscar and Molly have grown up knowing that doggs and katts are mortal enemies, each side hating the other. It's just what doggs and katts do. Doggs are smelly, drool on everything and all they think about is chasing katts up trees. And katts, well they're stuck up and they have icky hairballs and step on litter. Gross. One thing they both agree on is that while they're vacationing at the Western Frontier Park they will stay in their respective camps. Oscar is a fun loving, rambunctious dogg, who' Oscar and Molly have grown up knowing that doggs and katts are mortal enemies, each side hating the other. It's just what doggs and katts do. Doggs are smelly, drool on everything and all they think about is chasing katts up trees. And katts, well they're stuck up and they have icky hairballs and step on litter. Gross. One thing they both agree on is that while they're vacationing at the Western Frontier Park they will stay in their respective camps. Oscar is a fun loving, rambunctious dogg, who's stellar at long distance running, but also easily distracted. Molly, on the other hand, thinks of herself as dignified, has plans to be an actress and knows she's destined for great things. Yet when a squirrel and butterfly cross their path, they both can't resist the urge to chase them through the woods, resulting in both of them becoming hopelessly lost. When they happen to stumble into each other, their natural instincts take over but eventually realize that working together is the only chance they have to get back to their families. Each chapter is broken down into three to four pages with illustrations every couple of pages. I so wanted to love this book, I thought it would be funny, seemed to have an interesting premise, and maybe there'd be a little conflict. It has a great setup cause most dog's and cat's really don't get along and I was curious how they would fend when they got lost and had to rely on each other. It just wasn't as light and funny as I was expecting. I think it's partially because one of the important concepts of Katt vs. Dogg is that each side hates the other, which is fine given the animal's nature but there seemed to be an exorbitant amount of insults to push this thought forward. The cats and dogs referred to each other as dumb, stupid, and ignorant. Sure there are a few funny insults thrown in but it seemed like a large portion of the beginning of the book was setting up how much their families historically hated each other. I don't know maybe it's just me and children will gloss over the insults and see two arch enemies becoming friends. And they really do become friends in the end, but it kinda zapped some of my enjoyment. The overall messaging of Molly and Oscar being stronger when they work together is rather nice and there are some interesting statistics about dogs and cats, like cats having more than twenty muscles to control their ears and that the average dog can run twenty miles per hour which I really enjoyed. In the end, they do determine they have more in common than they initially thought and there is an overall happy ending. There's also an interesting mix of characters with hybrids including a wolfbear, lionodiles and a kindly doggkatt who offers them help and advice. Plus, being lost in the wilderness, they have lots of obstacles to overcome, including a hungry mountain lion and a huge river they need to cross. So yeah, some adventuring, danger and creative mechanisms of getting them back to base camp. Given cat and dogs are so popular as pets, I can certainly see the kid appeal. What a great story for kids, and if read with parents it has an opportunity to teach children that what we assume to be correct about someone/or some race is not correct. In doggs vs katt Oscar (dogg) and his family are going on vacation. Molly (katt) and her family are going on vacation. When they arrive at the campground they are sent to their specific areas, kattville and dogworld. Somehow both Molly and Oscar get lost and find each other. Will they overcome the hatred they have been taught, What a great story for kids, and if read with parents it has an opportunity to teach children that what we assume to be correct about someone/or some race is not correct. In doggs vs katt Oscar (dogg) and his family are going on vacation. Molly (katt) and her family are going on vacation. When they arrive at the campground they are sent to their specific areas, kattville and dogworld. Somehow both Molly and Oscar get lost and find each other. Will they overcome the hatred they have been taught, and learn to work together to survive? This is a funny tale about individuals ultimately learning to work together. The Katt clan and the Dogg families are sworn enemies, and the puppies and kitties follow their parents lead. When something dangerous occurs during their camping vacation, the animals show their true colors. If you own a dog or cat, some of the actions the animals do are true to life and very amusing. Both cat and dog lovers will enjoy this whimsical tale of rivalry.But as we learn or already know-they can be the best of buddies too.A friend or supporter can be found in the most unlikely place or at the weirdest time. World's best source for every cat and dog pun every said! Cute, light-hearted read with a great message! Love the play on words and quirky information about cats and dogs! Can’t wait to book talk this one! Ok, if you don't think I'm going to be Team Katt you don't really know me! Cute, definitely great for MG readers, filled with puns. What else needs to be said?